My grandfather Joseph Batty's name is on this tablet, he died on 17th July 1916, and is buried in France. 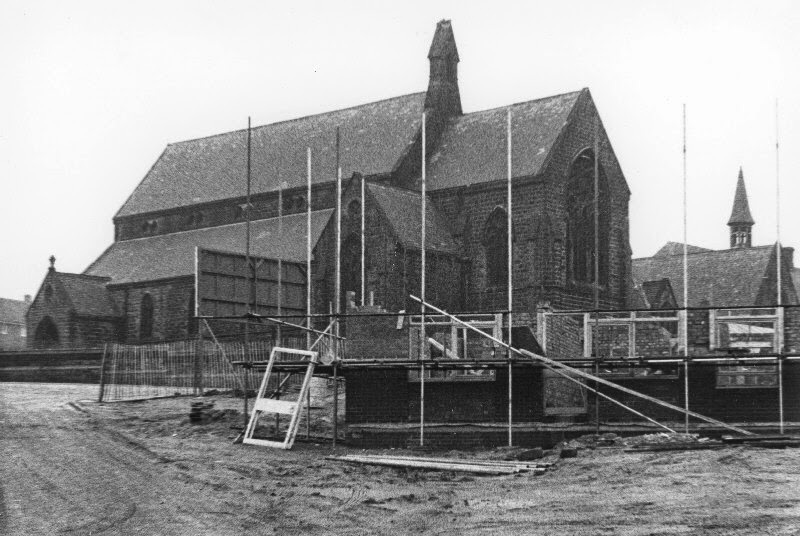 When the Church was demolished in 1964, the tablet was removed and was placed in Heeley Street Church for a temporary period, from there I do not know what happened to it in that Heeley Street Church has also been demolished. If anyone can help me trace this tablet it would be so much appreciated by me. That's given me hope that it may have survived. We know it didn't go to St Peter's, so we must make sure to check all the other non-conformist chapels, as well as the C of E churches. It could be hidden in a corner, a staircase or an upstairs room - we've seen this with other memorials. It would be wonderful if it has survived, some of my own husband's relatives are on the list! Hello.. my great uncle is shown on that list (Norman theaker. Any thoughts why there was a memorial in two churches ..
Ah, yes, he's on St John's and St George's. They are adjacent parishes and it is quite likely that some members of his family lived in one parish and some in another. Was he married? If so where did he marry? Where did his family live in 1911? This duplication is one of the reasons creating a Roll of Honour isn't going to be a straightforward task - we need to positively identify each name (hard when there's only an initial instead of a forename) on each memorial then whittle the list down to just one record for each man, retaining the mention of each memorial they are listed on. Of course sometimes two identical names can be two different men! I have a Walter Jackson on three memorials - two are the same man and one is a completely different chap. Glad to see you found some useful info Mel! First, let me say you are doing great work with this project! In researching something entirely different (I was searching for a photo of St. Luke's Church in Worsborough Common) I happened on a name I recognized, William Padley Tindall, in their War Memorial site. Now, "Padley" is not a rare name in England, but it is uncommon enough that I take notice when I run across it! William Padley Tindall was the oldest son of my grandfather's half-brother, George Tindall. I know that William Padley Tindall lived in the St. John's Parish area of Barnsley. He was married at St John's in 1903, and I realize that the church has been demolished. I also know that he perished in France in 1916. I was not expecting to find evidence on a memorial, so imagine my surprise when I found him on two! I believe W P Tindall never lived in Worsborough Common, but his brother, James Arthur Tindall, did, and was married at St. Luke's. James Arthur barely survived the war, but returned home after being seriously wounded for the third time. I believe he and his family would have been responsible for adding William Padley Tindall to the St. Luke's Memorial. It is nice to know that William P's own church memorial may have survived and is waiting to be discovered.